Although there's no mention of it on either the University's main website or athletic website, this USTA Florida sectional tennis briefing contains the unfortunate news that Division I Jacksonville University is dropping both its men's and women's tennis programs after this year. Jacksonville University, in Jacksonville, Florida, is a member of the Atlantic Sun conference. President Kerry Romesburg is quoted as saying: "Tennis is a program in which we invest a substantial amount of funding based on the roster size, and our recommendation has nothing to do with dissatisfaction with our program, our coaches, or our student-athletes. It is driven completely by the rising cost of athletics in general, and an attempt to better focus our limited athletic resources. We realize this is a difficult and unpopular decision, especially since there are many advocates for the program and very few detractors. However, it is the best decision for our university." Although this isn't the jolt the Maryland men's tennis program's elimination sent through the collegiate tennis community, it is depressing nonetheless and it's hard to think we've seen the end of these announcements. The Tennis Recruiting Network's women's recruiting class rankings were revealed yesterday, with the University of Virginia coming out on top in a very close race with Georgia Tech, who also received commitments from three blue chips and a five-star. Following Virginia and Georgia Tech in these initial rankings are North Carolina, Stanford and Vanderbilt. Another set of rankings for the 2012-13 class will be released after the spring signing period. Australia's Luke Saville is one of the rare juniors to hold two slam titles at once, but because of Bernard Tomic's success, he has been able to avoid much of the frenzy that often surrounds a "next big thing" during his country's grand slam. 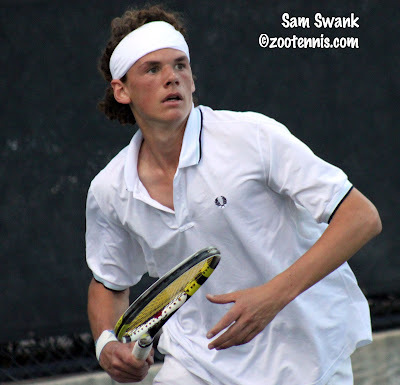 In this article Saville talks about the other Australian teens having success on the professional level, and in this one, about his hope for a Wimbledon main draw wild card. As the Wimbledon junior champion, he will certainly receive one into the qualifying, but I believe he's correct in saying he will have to win quite a few professional matches between now and then before standing a real chance for a main draw wild card. There is no reciprocal wild card between Wimbledon and the other slams, but they do not necessarily allocate all their wild cards to British players either, feeling that process has resulted in a lack of work ethic among some of the regular recipients. And for those of you patiently waiting for my response to the Wayne Bryan letter to the USTA, it's coming tomorrow. In the meantime, here's what John McEnroe had to say about the historic lack of Americans in the second week of the Australian Open. When you consider that the draft for the ITA's Kickoff Weekend takes place right in the summer, long before the new school year starts, it amazes me that there aren't more upsets. The host teams are chosen by final rankings, but those ranked (roughly) 16-65 select where they want to play. Although travel time and cost are certainly considerations, teams outside the Top 15 hope to select a 4-team regional that gives them the best chance for an upset of a higher-ranked team, and a place in the ITA Team Indoor next month. The toughest region on the men's side was hosted by Georgia Tech, with four teams inside the Top 20; Tech(19), Illinois(15), North Carolina(18) and Auburn(20). It was there that the only men's seeded upset occurred, with No. 4 seed Auburn beating Georgia Tech in the first round and North Carolina in the final, both by 4-1 scores. There were some close calls for the top-seeded host team, with Tennessee just squeezing by No. 3 seed Ole Miss 4-3 this evening, after the Rebels had beaten No. 2 seed Oklahoma in another very tough region. Texas A&M also came through by a 4-3 score over Mississippi State, with Baylor winning 4-3 over Florida State, a No. 3 seed. On the women's side, there were three host teams and No. 1 seeds who failed to reach Charlottesvile, the site of both the women's and men's team indoor championships. Texas, a No. 2 seed, beat host Vanderbilt 4-1; USC, a No. 2 seed, beat host Arizona State 6-1, and Ole Miss, a No. 3 seed, defeated host Florida State 4-3. Ole Miss, who hadn't sent their women's team to the Indoor since 2000, wasn't the only team earning their spot by the narrowest of margins. Northwestern beat Nebraska 4-3 to win their regional, while in the match I'm covering for Tennis Recruiting Network, Michigan got by Yale by that same slim margin. The ITA has provided an easy-to-read compilation page of all the results from the Kickoff Weekend here. The only Pro Circuit events in the United States last week were on the men's side, with a $10,000 Futures in Weston and a $50,000 Challenger in Hawaii. 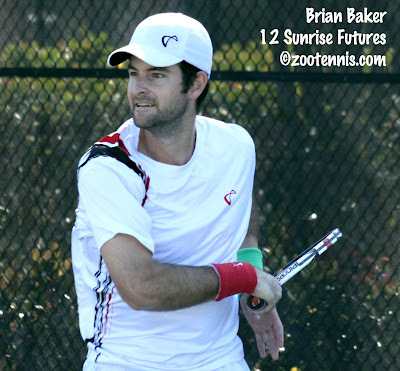 Brian Baker continued his comeback by winning the singles title in Weston, beating 18-year-old Jason Kubler of Australia 7-5, 6-3 in a battle of unseeded players. 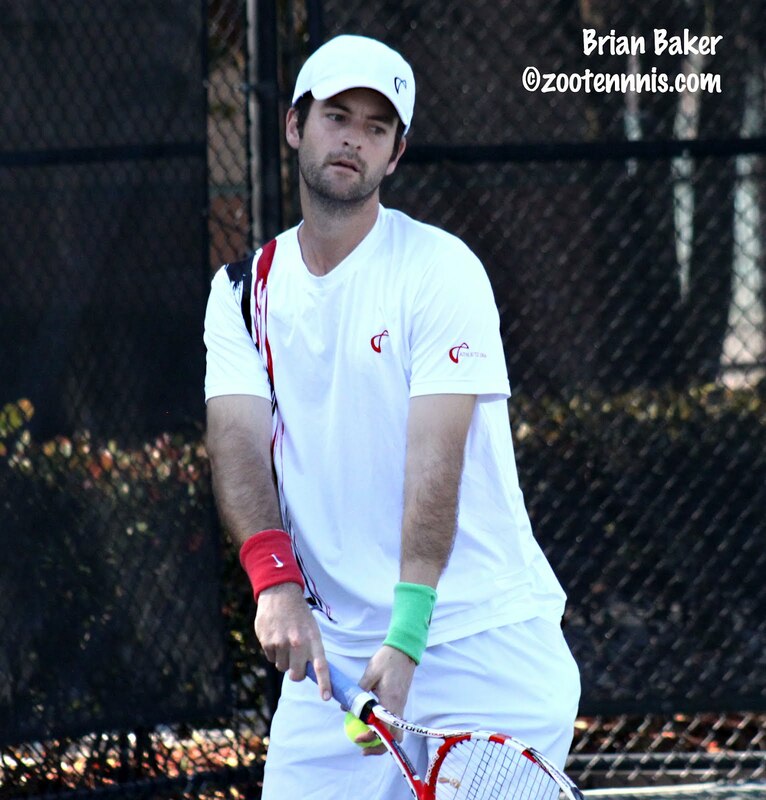 Recent collegians Rhyne Williams and Jeff Dadamo, a qualifier, made the semifinals. The doubles title went to Dennis Novikov and Daniel Kosakowski, who beat Vahid Mirzadeh and Michael Shabaz 6-4, 7-6(4) in another all-unseeded final. In Hawaii, top seed Go Soeda of Japan beat unseeded Robby Ginepri 6-3, 7-6(5) to take the singles title. Unseeded Amer Delic and Travis Rettenmaier won the doubles, defeating No. 3 seeds Nick Monroe and Jack Sock 6-4, 7-6(3). Austin Krajicek and Devin Britton captured their first doubles title as a team, winning the $15,000 Futures in Mexico last week. Dimitar Kutrovsky, the former Texas All-American, won his first Futures singles title in Turkey. The women are back in action this week, at a $25,000 tournament in Rancho Santa Fe, while the men are in Palm Coast for another $10,000 tournament on clay. I've just returned from Ann Arbor, where the University of Michigan women squeezed past Yale 4-3 to win the ITA Kickoff weekend regional and a place in the Team Indoor next month in Charlottesville. I'll have a complete account of the match for the Tennis Recruiting Network later this week, and on this site tomorrow, I'll try to wrap up all the results from the sites around the country. Several do not finish until Monday, if they hosted both men and women. Today in Tarbes, France, American Frances Tiafoe completed his sweep of Les Petits As titles, winning the singles final from William Blumberg of the US 6-0, 6-2. Tiafoe, who turned 14 during this USTA-sponsored European trip, won the Teen Tennis singles title in Bolton last week, so he came into Les Petits As as a favorite, and a target. although he was only seeded No. 4. His toughest match came in the semifinals against fellow American Nathan Ponwith, the No. 10 seed, with Tiafoe dropping his only set of the tournament before recording a 2-6, 6-2, 6-4 win. Tiafoe won the doubles title on Saturday with partner Michael Mmoh of the US, beating Ponwith and Blumberg in another all-American final. Tiafoe, who trains at the Junior Tennis Champions Center in College Park, Maryland, is the second consecutive American boy to capture the prestigious 14-and-under tournament. Henrik Wiersholm won the championship last year. This year's all-American final was only the second time the tournament's 30-year history that it featured two players from the same country. The previous one, in 2003, also was between two Americans, with Donald Young beating Leo Rosenberg. This year the United States made history with all four semifinalists, which had never been done. In the girls final, 13-year-old Jacqueline Cristian of Romania, upset No. 4 seed Tornado Ali Black of the US 6-2, 6-3. Cristian, the No. 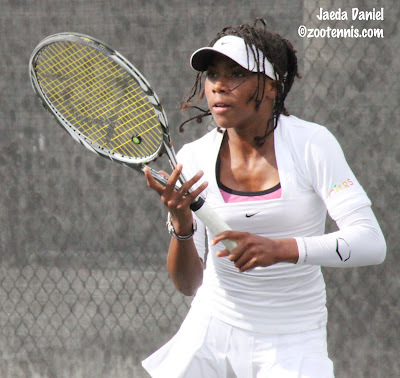 11 seed, hadn't had nearly as much success in the international junior tournaments in Florida last month that Black enjoyed, but the Bucharest resident brought her A game to France this week. For the 13-year-old Black, it was another disappointing performance in a final. 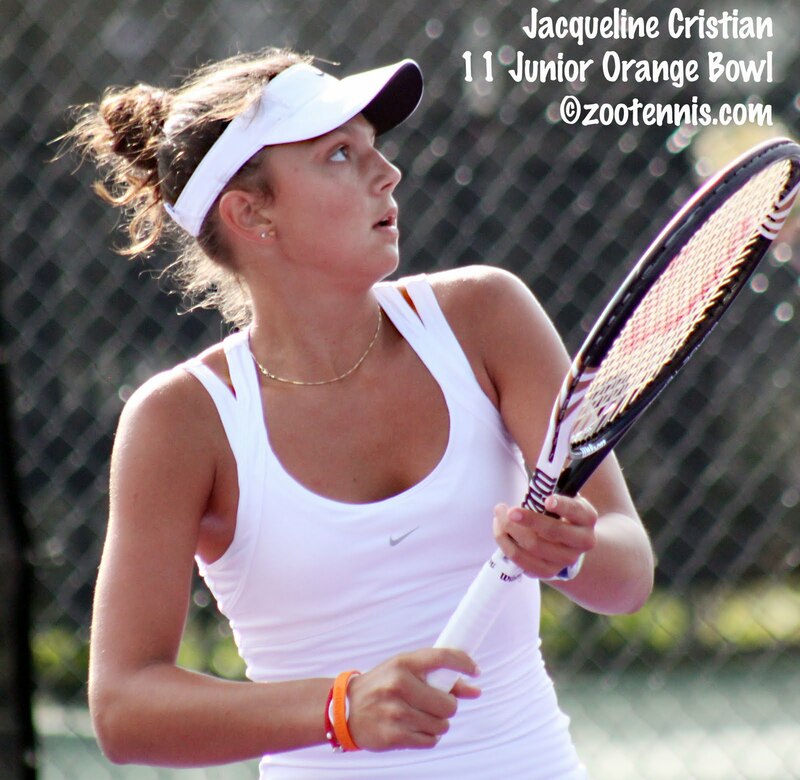 In her last three major 14-and-under tournaments--the Junior Orange Bowl, Teen Tennis and Les Petits As--she has lost the final in straight sets, and although reaching three straight finals is a remarkable accomplishment, she hasn't been able to perform her best at the last hurdle. Black did reach two singles finals and win two doubles titles with Nicole Frenkel on the trip, so she is just slightly behind Tiafoe on that scorecard. For complete results, see the tournament website, which also includes an outstanding photo gallery. Taylor Townsend added the Australian Open girls singles title to the doubles championship she won on Friday, beating No. 4 seed Yulia Putintseva of Russia 6-1, 3-6, 6-3 Saturday at Rod Laver Arena. The 14th-seeded Townsend dominated the first set, but those of us who know Putintseva's game knew the match was far from over, as she frequently falls behind, which motivates her to start playing better. Although Townsend played well during that stretch, and didn't show any sign of nerves in her first junior slam final, it was Putintseva's errors that kept the score from being close. Townsend didn't use her serve and volley game with any regularity, but with Putintseva spraying balls all over the place, she didn't need to, and the 15-year-old from Atlanta had the first set in less than 25 minutes. Putintseva immediately turned the match around in the second set, taking a 4-0 lead, and firing herself up with assorted shouts in various languages. Townsend looked a bit flat, but it might have been a conscious attempt to keep Putintseva's histrionics from affecting her play. Townsend began to get back into the set in the next game, when she broke Putintseva to make it 4-1, and she forced the 17-year-old Russian to play well to hold in the next two games, which evened the match. Townsend went down a break immediately in the third set, but Putintseva gave it right back. In the third game, Townsend displayed some of her volleying skills with a doubles-like exchange at the net, and although it took her three more ads after that to secure the game, she did take the lead 2-1. With Townsend holding at love to make it 4-3, Putintseva couldn't afford a sloppy game, but a double fault and a backhand error put her in a 0-30 hole, and a forehand winner by Townsend gave the American two break points. She didn't convert the first, with her defensive shot drifting long, but Putintseva sliced a backhand into the net on the second, and Townsend would serve for the championship. She lost the first point of the final game, when Putintseva attacked and put away an overhead, but Townsend's serve withstood the pressure. She hit an ace to go up 30-15, and another good first serve resulted in Putintseva netting a return. A third well-executed first serve gave Townsend the match, and she dropped to her knees on the court to allow the reality to sink in. Within a few seconds, both girls were in tears, one in happiness and one in disappointment. With the win, Townsend is the second American girl to hold an Australian Open girls title. The first was Kim Kessaris in 1989. According to the USTA, she also becomes the first American girl to sweep the singles and doubles at a junior slam since Lindsay Davenport accomplished that at the US Open in 1992. For more on Townsend's win, see the Australian Open website, Sandra Harwitt's piece for ESPNHS, and Ben Rothenberg's post for the New York Times Straight Sets blog. Steve Tignor of tennis.com is in Australia too, and he had this post on Townsend for his Concrete Elbow blog. The boys final also went to three sets, with top seed Luke Saville of Australia avenging his loss to Canadian Filip Peliwo in the Grade 1 the previous week, taking a 6-3, 5-7, 6-4 victory. Saville, who reached the final in Melbourne last year, now holds two of the four junior slam titles, having won Wimbledon last July, and will be difficult to dethrone at the top of the ITF junior rankings for the remainder of 2012. For more on Saville's win, see the Australian Open website and the ITF junior website. The finals are set at Les Petits As, with three young Americans attempting to add their names to the conversation of US junior champions that Townsend started on Thursday, when she and Gabby Andrews won the Australian girls doubles title. Tornado Ali Black, the No. 4 seed, reached the final with a 6-1, 6-1 win over No. 16 seed Maia Lumsden of Great Britain, who had beaten Black in the Teen Tennis final just a week ago. Black will play No. 11 seed Jacqueline Cristian of Romania in the final, looking for a sweep of the girls events. Black and Nicole Frenkel won the doubles title today with a 6-1, 6-2 victory over compatriots Emma Higuchi and Raquel Pedraza. 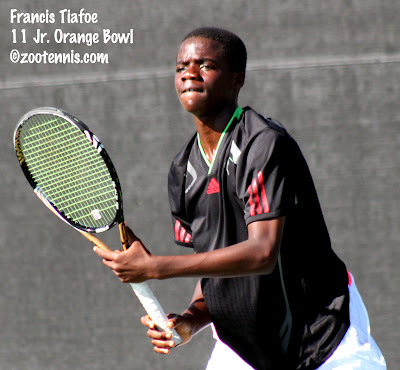 In the boys final, Francis Tiafoe, the No. 4 seed, will play No. 15 seed William Blumberg, in only the second final featuring players from the same country in the tournament's 30-year history. Tiafoe beat American Nathan Ponwith, the No. 10 seed, in today's semifinal 2-6, 6-2, 6-4, while No. 15 seed Blumberg surprised No. 5 seed Michael Mmoh of the US 6-4, 3-6, 7-5. Mmoh was serving for the match at 5-4 in the third, but Blumberg prevailed. Tiafoe and Mmoh won the doubles title today over Blumberg and Ponwith 6-2, 6-1, giving Tiafoe, who won the singles and doubles titles last week at Teen Tennis in England, the opportunity to win all four titles on this European trip. CORRECTION: Blumberg and Ponwith won the Teen Tennis boys doubles. For the draws, and live scoring, see the tournament website. 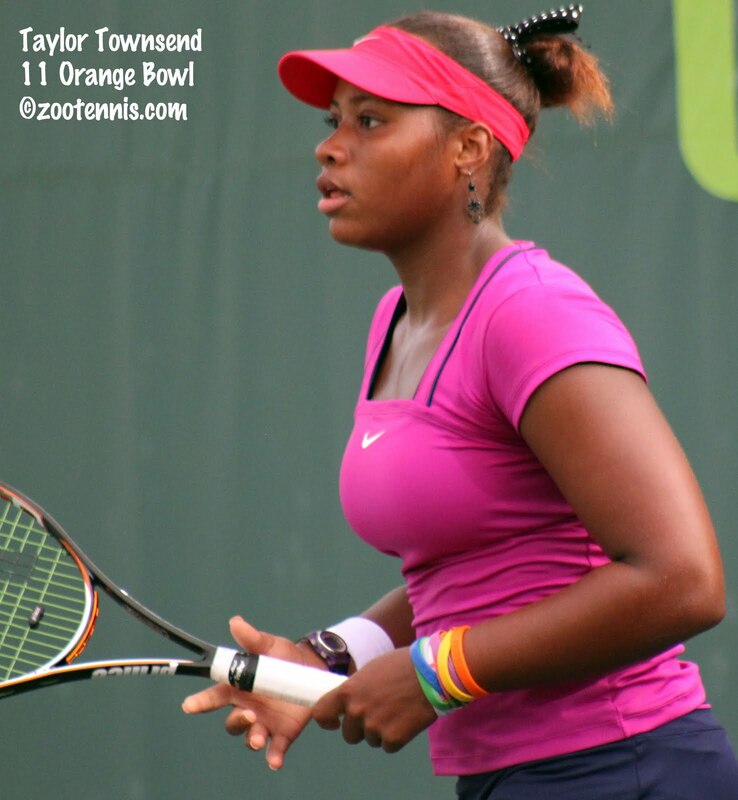 Taylor Townsend defeated Krista Hardebeck Friday 7-6(3), 6-4 to advance to the final of the Australian Open junior championships, where she will play No. 4 seed Yulia Putintseva of Russia. Townsend, the No. 14 seed, is playing in just her second junior slam (although she did play the US Open junior qualifying, losing in the first round, in 2010), while Putintseva is competing in her eighth. The two met in the semifinals of the Eddie Herr last month, and here is my account of that three-hour battle. Putintseva has the advantage in experience, being more than a year older, but she won't take Townsend lightly after that match, especially with the faster surface in Melbourne favoring Townsend's net game. The match will be held on Rod Laver Arena and will be streamed live at the Australian Open website at 9 p.m. Eastern time tonight. Against Hardebeck, Townsend fought off two set points serving at 4-5 in the first set and went on to win the tiebreaker. She fell behind 3-1 and 4-2 in the second set, but took the final four games of the match to avenge her quarterfinal loss to Hardebeck at the Loy Yang Grade 1 in Traralgon last week. 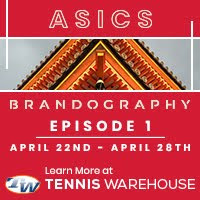 For more on Townsend's win over Hardebeck, see this ESPNHS article by Sandra Harwitt and this one by Karen Pestaina of Tennis Panorama News, both of whom are in Melbourne. Putintseva beat No. 2 seed Eugenie Bouchard of Canada 7-5, 6-1 Friday to advance to her second junior slam final. The boys final will be a rematch of the Traralgon final, with No. 1 seed Luke Saville of Australia hoping to avenge his three-set loss to Filip Peliwo of Canada. Saville had surprisingly little trouble with No. 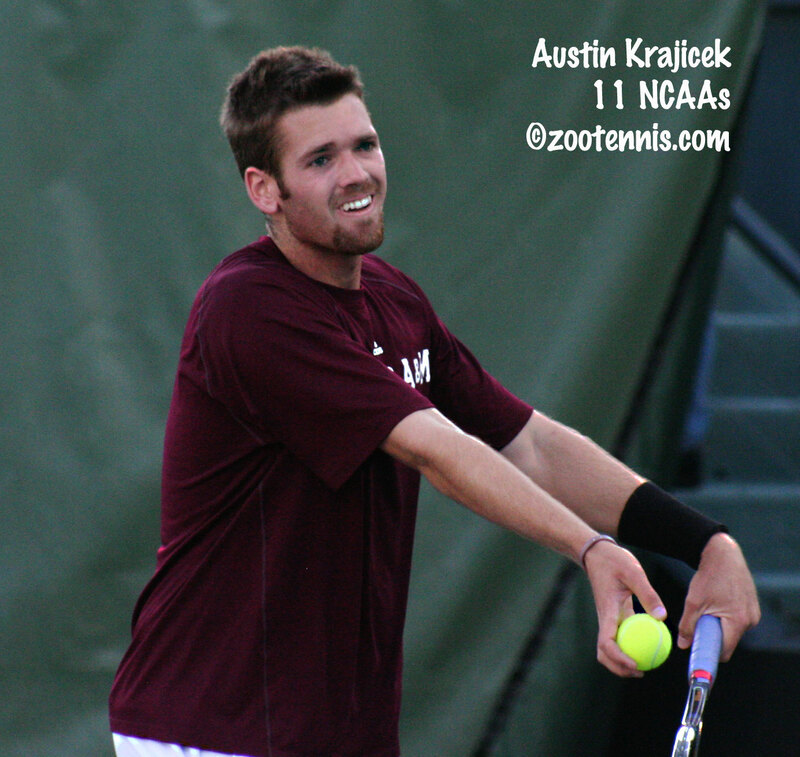 10 seed Adam Pavlasek of the Czech Republic, who had beaten Saville in their previous two meeting back in September. Saville, the 2011 finalist, posted a 6-3, 6-4 victory over Pavlasek, who is now one of the world's most famous juniors due to his romantic relationship with Wimbledon champion Petra Kvitova. Peliwo, unseeded in Melbourne, beat qualifier Mackenzie McDonald of the US 6-4, 6-4 in the other semifinal. There were only four breaks in the match, with McDonald dropping serve in the opening game of each set. He got the break back in the second set, converting his only break point of the match, but lost serve at 4-4, and Peliwo closed it out. 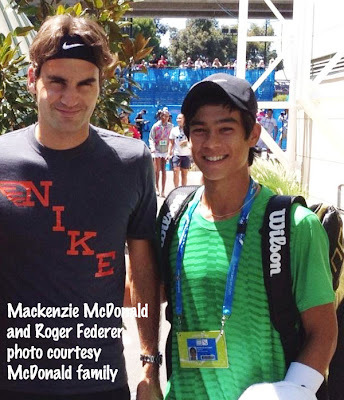 For more from the boys semifinals, see this article from the Australian Open website. Townsend and Gabby Andrews, who were unseeded, won the girls doubles title, beating top seeds Irina Khromacheva of Russia and Danka Kovinic of Montenegro 5-7, 7-5, 10-6. Andrews and Townsend lost to Khromacheva and Demi Schuurs in the final of the US Open girls doubles last year by the similar score of 6-4, 5-7, 10-5. 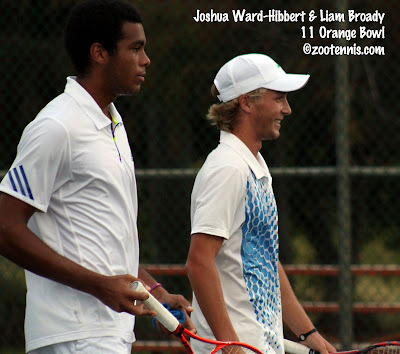 Orange Bowl champions Liam Broady and Joshua Ward-Hibbert of Great Britain won the boys doubles championship, with the No. 6 seeds defeating unseeded Pavlasek and Filip Veger of Croatia 6-3, 6-2. Last year Henrik Wiersholm won the boys title at Les Petits As, the pinnacle of 14-and-under tennis tournaments in Europe. 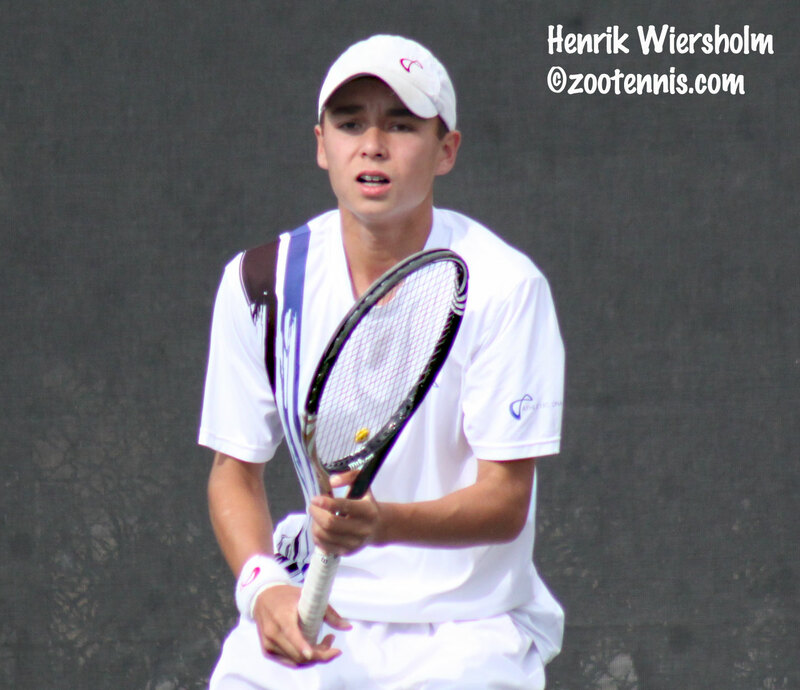 A year later, Wiersholm was winning a USTA 18-and-under tournament (see my recap of the Tennis Plaza Cup for the Tennis Recruiting Network), and the United States is already assured of another boys champion, with all four American boys reaching the semifinals. This is unprecedented in the tournament's 30 year history, according to TennisEurope, and the only other time two players from the same country met in the final, it was also the United States making history, with Donald Young beating Leo Rosenberg for the title. In one semifinal, No. 10 seed Nathan Ponwith will play No. 4 seed Francis Tiafoe; in the other, No. 5 seed Michael Mmoh will face No. 15 William Blumberg. The only US girl still remaining is Tornado Ali Black, the No. 4 seed, who will get her rematch with Maia Lumsden of Great Britain, who beat her in the final of Teen Tennis last week, in the semifinals. Unseeded Gabriella Taylor of Great Britain will play Jacqueline Christian of Romania in the other girls semifinal. They could hold the doubles finals back in the United States if they wished, as all four US teams are in the two finals. Black and Nicole Frenkel will play Emma Higuchi and Raquel Pedraza for the girls championship, while Mmoh and Tiafoe will play Blumberg and Ponwith. Complete results can be found at the tournament website. The ITA Kickoff weekend is underway today at various sites across the country, with 15 men's and 15 women's teams earning their spots at the Team Indoor championships next month. The ITA has a very thorough preview of all 30 regionals going on this weekend on their website, where you can also find the individual sites' information, live scoring and occasionally, live streaming. Americans have been notably absent from the second week of the Australian Open in the men's and women's draws, but the juniors have more than made up for that, with three Americans in the singles semifinals and a doubles team in the final. Unseeded Krista Hardebeck beat World No. 1 and top seed Irina Khromacheva of Russia 6-3, 6-3 Thursday to claim her first junior slam semifinal berth. Hardebeck has not lost a set in Australia, winning the Grade 1 in Traralgon last week as a qualifier, thereby earning a special exemption into the main draw in Melbourne. Hardebeck's semifinal opponent will be No. 14 seed Taylor Townsend, who had a much tougher quarterfinal match. The 15-year-old left-hander beat No. 12 seed Sabina Sharipova of Uzbekistan 6-3, 2-6, 6-4, blowing a 3-0 lead in the third set, losing four straight games, then winning the last three games to move into the semifinals against Hardebeck. The two Americans met last week in the quarterfinals in Traralgon, with Hardebeck taking a 6-4, 6-2 victory. Townsend also reached the doubles final with Gabby Andrews, with the unseeded 2011 US Open girls finalists cruising through the draw all week. They have lost only 10 games in their four wins, and will have extra motivation against the top-seeded team of Khromacheva and Danka Kovinic of Montenegro in Friday's final(Thursday night in the US). Khromacheva was half of the team (with Demi Schuurs) that beat Andrews and Townsend in the girls doubles final in New York. With Townsend and Hardebeck playing each other, an American girls finalist is assured for the first time since 2007, when Madison Brengle lost in the championship match to Anastasia Pavlyuchenkova. Mackenzie McDonald's win over unseeded Robin Stanek of the Czech Republic is one of the most memorable matches I've ever watched via live scoring. McDonald, who qualified for both Traralgon and the AO, was down 6-0, 4-0, 30-0 before coming back for a 0-6, 6-4, 6-2 win. I have no idea how he did it, and would have loved to see it live; a turnaround like that in a junior slam, or anywhere for that matter, is extremely rare. McDonald will play unseeded Filip Peliwo of Canada, who won the Grade 1 in Traralgon, and beat McDonald 6-0, 6-1 in the quarterfinals of the Pan American Closed last October. Peliwo has also shown the ability to comeback during the tournament, so no matter what the score, it's safe to say that a prediction is risky. The other boys semifinal will feature top seed and 2011 finalist Luke Saville of Australia against his nemesis Adam Pavlasek of the Czech Republic. Pavlasek beat Saville in back-to-back weeks at the Canadian Grade 1 and US Open juniors, so the No. 10 seed may be an underdog by seeding only, not in reality. The second girls semifinal has No. 2 seed and 2011 semifinalist Eugenie Bouchard of Canada against No. 4 seed and Eddie Herr champion Yulia Putintseva of Russia. Bouchard is seeking her first junior slam singles final, while Putintseva reached the 2010 US Open girls final. The singles semifinals and doubles finals are later tonight in the US, and I will be staying up to watch the live scoring and tweeting. There will be no live stream for the semifinals. The junior draws can be found at the Australian Open website. In Tarbes, the US boys continue their impressive showing, with all four of them in the quarterfinals for the second straight week. Nathan Ponwith(10), William Blumberg(15), Michael Mmoh(5) and Francis Tiafoe(4) all advanced in both singles and doubles at Les Petits As and with all four in different quarters, could all advance to the semifinals. Raquel Pedraza and Tornado Ali Black(4) remain in the girls draw, both in the top half, while Black and Nicole Frenkel and Pedraza and Emma Higuchi are also in the doubles semifinals. For complete draws and live scoring, see the tournament website. Doug Robson has written an excellent article for USA Today about what happened to the young American men, born in 1986 or 1987, who decided to turn pro rather than go to college. Dubbing them the "Lost Generation," Robson talks with Brendan Evans, Scott Oudsema, Phillip Simmonds and Alex Kuznetsov, who signed with sports management agencies and went out on the pro tour. Back in 2004, I wrote a similar piece, although it focused on Oudsema, who is from Kalamazoo, where I live. Reading it again, I'm struck by how certain everyone was that Oudsema was making the right choice, that he would be a successful professional. Current Australian Open director Craig Tiley, then the head men's coach at the University of Illinois, put Oudsema's odds of success at "100 percent." I'm also struck by how few of the people I quoted seven years ago still are working in the jobs they had then. 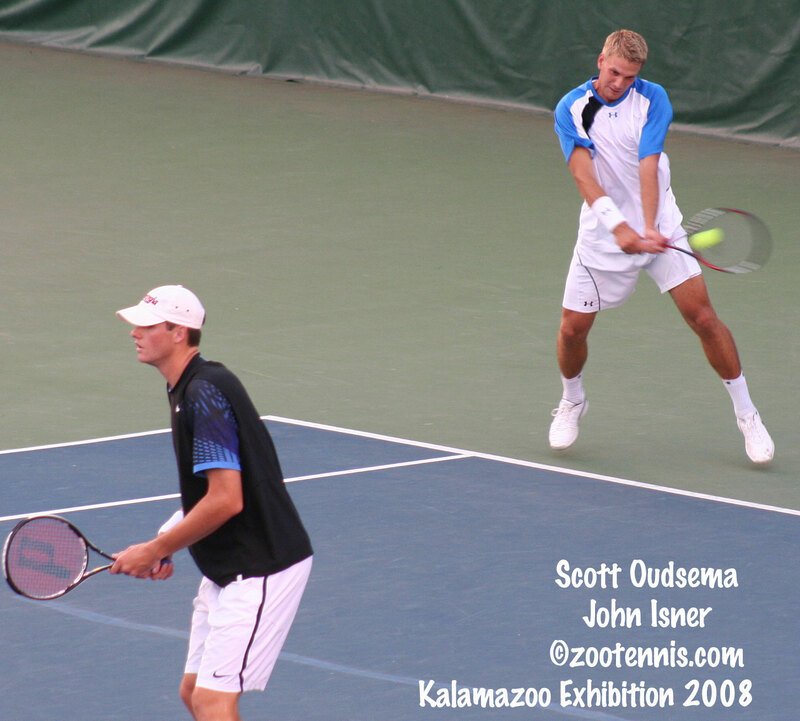 USTA coach David Nainkin may be the only one, although Walker is still a prominent junior development coach in the Kalamazoo area, just at a different club. While Evans and his peers struggled, a few others of similar age that chose to spend time in college have generally had more success, none more so than John Isner. The 26-year-old, who spent four years at the university of Georgia, reached the U.S. Open quarterfinals last year. He is at a career-high No. 17. "I think they thought it was going to be easier than it was," says the nearly 6-10 Isner, who rode his serve into the top 100 within a few months of going pro in 2007. "For me, I went to college. I didn't put any pressure on myself. I had the experience of college tennis under my belt. I won a lot, whereas these guys early in their career didn't. When I left college I was ready to go." Robson understands that there is no right answer in what will remain a difficult decision for all elite level American juniors. "Still, it's dangerous to generalize." writes Robson. "The decision to go to college or turn pro is influenced by many factors from physical maturity to financial situation. Some players are better off jumping to the pros and grinding it out while others are better served by spending time in the more structured environment of college." Robson's article is about young men, but a current young woman faced a similar choice a year ago. Beatrice Capra, who reached the third round of the US Open in 2010 as a wild card, is now a freshman at Duke University. I wrote this article for Tennis Recruiting Network about Capra's decision early last year, but she tells it very well herself in this USTA college spotlight. The first of two men's recruiting class rankings is out at the Tennis Recruiting Network, with Stanford topping the list, followed by Virginia, Duke, Georgia and Texas A&M. The women's list will be released on Monday. 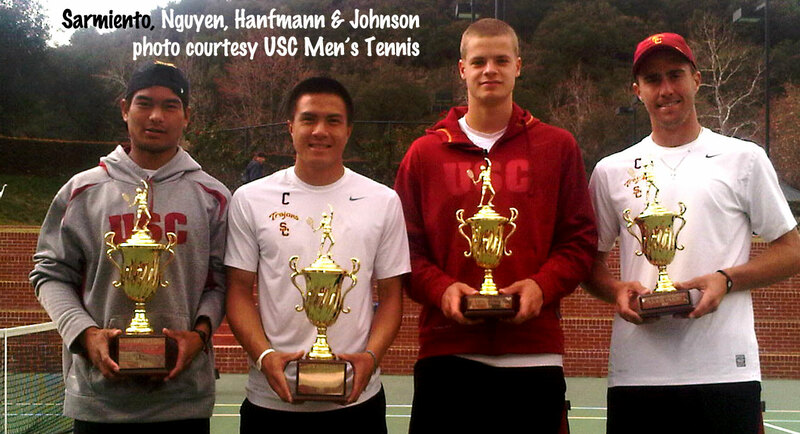 The second ITA team rankings of 2012 were released yesterday, with USC men and Florida women remaining on top. Some teams have not even played a dual match yet this year, so there weren't a lot of dramatic changes in the rankings. The North Carolina women fell from 4 to 8 after a loss to Texas, who climbed from 21 to 15, and the Florida men, previously No. 8, beat No. 5 Baylor 6-1 Sunday, with the two schools switching places in the rankings. For the complete rankings, see the rankings page at the ITA website. Dual match results are available at the ITA website as well. 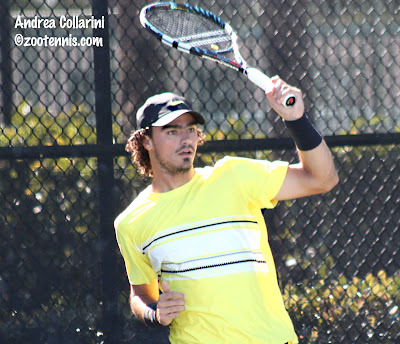 I've returned to Michigan from South Florida and after two days at Pro Circuit events and three days covering the USTA Level 3 Plaza Cup, it's time to catch up on what's happening in the two junior "majors" this week: the Australian Open and Les Petits As. In Melbourne, six Americans--five girls and one boy--have reached the round of 16 and play Wednesday(Tuesday night in the US) for a place in the quarterfinals. 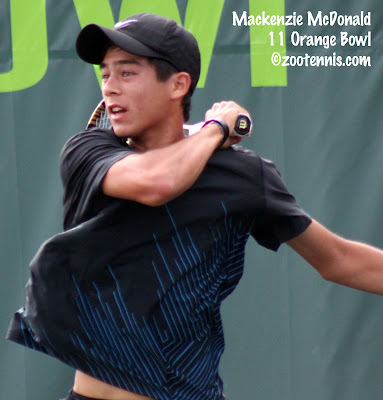 Qualifier Mackenzie McDonald, pictured above, plays No. 6 seed Andrew Harris of Australia in the third round. The 16-year-old McDonald had an easy 6-2, 6-1 win over Mathias Bourgue of France in the second round. Krista Hardebeck, who won the Grade 1 Loy Yang Traralgon last week as a qualifier, kept her 2012 winning streak going with a surprisingly easy 6-1, 6-3 victory over No. 9 seed Saisai Zheng of China in the second round. Zheng received main draw entry and her seeding based on her WTA ranking, which is currently 282. Hardebeck, who has yet to drop a set in Australia, now plays No. 8 seed Anna Schmiedlova of Slovakia in a rematch of the Traralgon final, which Hardebeck won 7-5, 6-4. No. 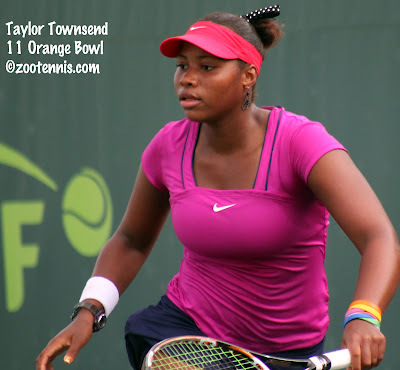 14 seed Taylor Townsend will play Orange Bowl champion Anett Kontaveit of Estonia, the No. 3 seed in another Loy Yang rematch. Townsend had beaten Kontaveit 6-1, 7-6(3) in the third round last week before falling to Hardebeck. No. 16 seed Kyle McPhillips takes on doubles partner and No. 4 seed Yulia Putintseva of Russia Wednesday, while Samantha Crawford meets No. 12 seed Sabina Sharapova of Uzbekistan. Christina Makarova, who reached the quarterfinals at the Australian Open junior championships last year as a 14-year-old, plays No. 2 seed Eugenie Bouchard in the third round. 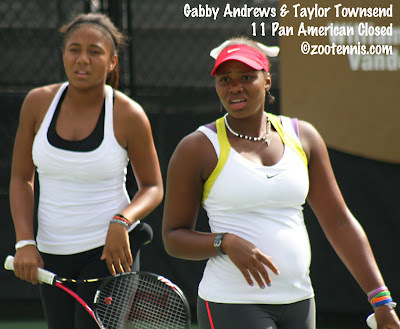 Townsend and Gabby Andrews, the 2011 US Open junior doubles finalists, have reached the quarterfinals in Melbourne, as has the team of McPhillips and Putintseva. 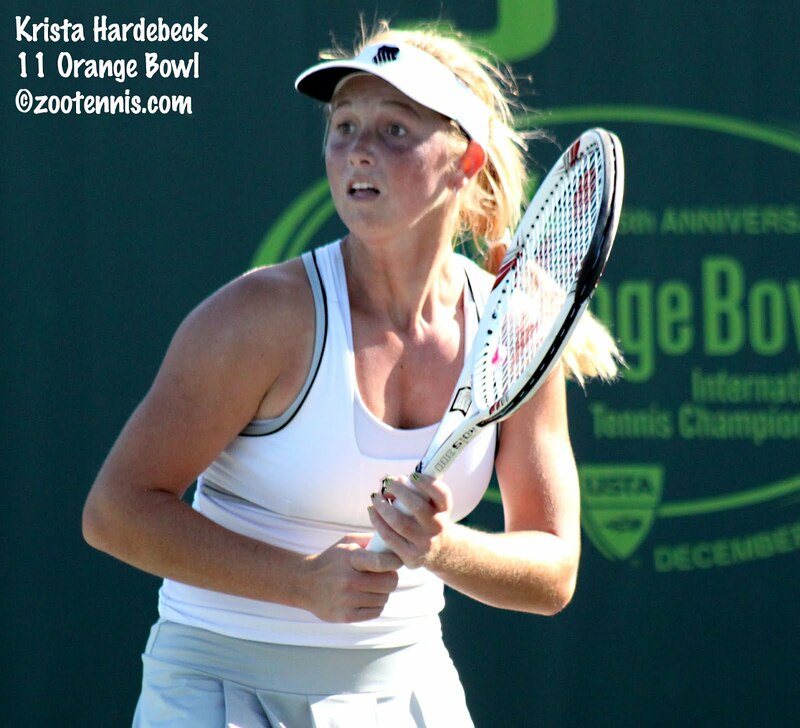 For more from the American girls, see Sandra Harwitt's article on the ITF junior website, which also contains photos of Hardebeck and McDonald in competition. Top seeds Irina Khromacheva of Russia and Luke Saville of Australia have also reached the third round. For live scoring of tonight's third round matches, see the Australian Open website. In Tarbes, Les Petits As first round is complete, and unseeded American Nicole Frenkel has upset No. 2 seed Karine Sarkisova of Russia 6-4, 6-3 to join the three other US girls on the trip in the second round. Tornado Black, the No. 4 seed, Emma Higuchi, the No. 14 seed, and unseeded Raquel Pedraza all won their opening matches in straight sets. After their impressive showing at Teen Tennis, when all four made the quarterfinals, the American boys all received seeds at Les Petits As. Nathan Ponwith(10), William Blumberg(15) Teen Tennis finalist Michael Mmoh(5) and Teen Tennis champion Francis Tiafoe(4) all won their opening round matches in straight sets. Like the girls No. 2 seed, the boys No. 2 also went out in the opening round, with Denys Klok of Ukraine falling 6-1, 6-0 to Samuel Ferguson of Great Britain. The top seeds are the same for Les Petits As as they were at Teen Tennis last week, with Kenneth Raisma of Estonia and Olga Fridman of Ukraine tabbed as No. 1s. For complete results, and also live scoring throughout the day, see the tournament website. 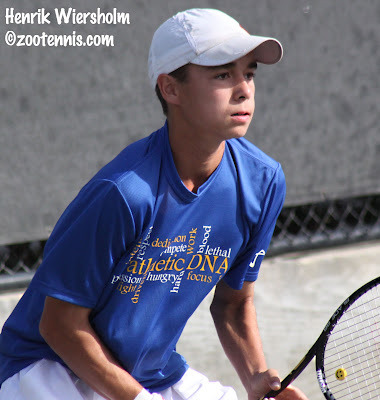 Fourteen-year-old Henrik Wiersholm went from second alternate to champion, winning the Tennis Plaza Cup boys 18s title Monday morning with a convincing 6-0, 6-1 victory over No. 2 seed Ognjen Samardzic. Wiersholm dominated the championship match from the outset on a warm and breezy morning at Salvadore Park, even though the Pacific Northwest native plays and trains more often on indoor hard courts than the Har-Tru court surface of this tournament. "I've never had very good results on clay," said Wiersholm, who has just begun living and training at the USTA's Boca Raton Center. "But for the last couple of weeks I've been able to train on it and I'm getting used to it. It's a big difference, but I like it. It's tough, it's physical." Although both finalists had tough three-setters in their semifinal matches Sunday, it was the older and bigger Samardzic who seemed to feel the effects of the four matches in two days. The 16-year-old from Bradenton, Florida had a difficult time sustaining rallies, and at one point said, "I guarantee my mom could make more balls in the court." Wiersholm, who needed two players to drop out to get into the tournament, kept his level of play high. Even the erratic play of Samardzic didn't cause his own level to drop, and he won the first ten games of the match before dropping his serve to give the 2011 finalist his only game of the match. "I think he was a little bit tired from his last match," said Wiersholm, who a year ago at this time was winning the Les Petits As title. "That definitely helped me out when I came out to a strong start at the beginning. I was a little bit tired, but I told myself if I could get an extra boost of energy at the beginning, I could sustain that, which is what I did." Samardzic mentioned the fall he took in his 7-6 in the third semifinal win over Jake Albo may have contributed to his poor play, although he was careful not to use that as an excuse. "He deserved to win, props to him," said Samardzic, who lost to Brett Clark in last year's final. "Physically, I'm not one-hundred percent, but that's not an excuse. In tennis you have that all the time. He played much better than me today. There's not much to say. No excuses, he beat me pretty bad." The jump from the 14s to the 18s is, not surprisingly, a large one, according to Wiersholm. "Players are much more physical," said Wiersholm, who turns 15 in March. "You're not going to be able to beat them just off of technique. You have to beat them physically also. Guys are going to get to balls that kids aren't getting to in the 14s, and you have to realize that and prepare for it to happen." Wiersholm couldn't be happier with his level of play throughout the tournament, his second in the 18s division. "I played well," he said, then repeated, "I played well." 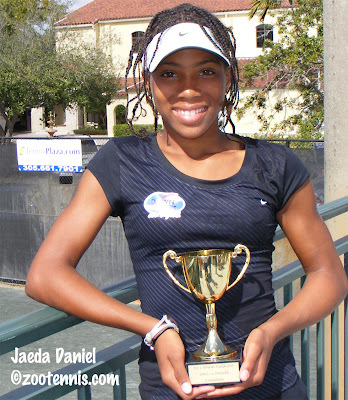 In the girls 14s final at the USTA Level 3 National tournament, unseeded Jaeda Daniel upset top seed Sofia Kenin 6-2, 7-6(4), earning her first win over her Florida rival. "I was playing my game and being aggressive," said the 12-year-old left-hander. "It's exciting." Kenin usually also plays an aggressive game, but the petite 13-year-old was making many more unforced errors than usual, especially in the first set. She gradually reduced those in the second set, only to see her serve go seriously haywire serving a 3-4. Kenin double faulted three consecutive times to give Daniel the opportunity to serve for the match, but Daniel couldn't convert, double faulting herself at 30-40 to get Kenin back on serve. Kenin held for 5-5, saving a match point when Daniel hit a second serve return long. She won her third straight game when Daniel was unable to get her first serve in during the next game. Although she didn't double fault, Daniel missed six straight first serves, and Kenin began pouncing on the harmless second serves Daniel gave her, and broke to go up 6-5. The breeze picked up midway through the match, but Daniel said that wasn't the reason she was having difficulty serving. "It wasn't that so much," said Daniel. "It was mostly me, and that's something I have to work on." Kenin made her first serves in the 6-5 game, but she was unable to keep the ball in the court, making three unforced errors, while Daniel forced another. In the tiebreaker, Kenin's serve problems resurfaced with two consecutive double faults and Daniel took a 4-1 lead. Kenin never led but she did get within one point at 4-3 and 5-4, only to make errors that gave Daniel a two-point cushion. At 6-4, Kenin got her second serve in, but after a short rally, Daniel took a chance on a big down the line forehand, and it was too big for Kenin, who couldn't reach it. The 12-year-old Daniel is now planning on playing more 14s tournaments, but hasn't yet decided on her schedule. Jean Thirouin is the only top seed to earn a championship at Salvadore Park, after he collected a come-from-behind victory over No. 2 seed Michael Kuznerko to claim the boys 14s title. Thirouin served for the opening set, lost it in a tiebreaker, but took control midway through the second set to post a 6-7(6), 6-3, 6-0 victory. "I got a little tight," Thirouin said of his failure to serve out the opening set at 5-4. "I played too flat and too safe. He also started playing better and controlling the points." Thirouin, who just began training full time at L'academie de Tennis in Boynton Beach, Florida, lost to Kuznerko at a National Open last July, so his ability to overcome the loss of the first set was especially satisfying. "In the third set I had lots of energy," said the 14-year-old, who is from Houston, Texas. "I played really, really well, compared to the other two sets. I kept the ball in play and played safe. I'm pretty happy with the way I played." Another top seed prevailed in the boys 12s, with Boris Kozlov defeating No. 2 Antonio Mora 6-1, 6-4 at the Biltmore Tennis Center. Rather than feeling the pressure of the top seeding, Kozlov looked at the positives of the number 1 after his name. "It kind of makes you want to win more," said Kozlov, the 11-year-old brother of Stefan Kozlov. "You feel more confidence when you go out on the court. So I don't think it's pressure, it's more like confidence." Mora had numerous game points that he failed to convert in the second set, and down 5-2, began resorting to moon balls to try to change his fortune. It worked for two games, but not a third, as Koslov held off the challenge in the final game. "He had a lot of chances," Kozlov said. "But he didn't take them, and I played pretty good." 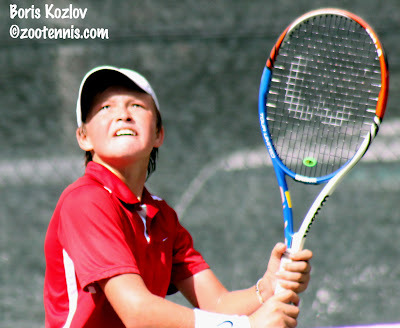 Kozlov will continue playing some 14s tournaments in Florida, his home section. "I'm going to to start playing more 14s, because the tournaments here are starting to get easy, and I'm winning almost every one," said Kozlov, who won a Florida 12s designated tournament earlier this month. "Not to sound cocky or anything, but my dad wants me to start playing more in the 14s." Girls 18s: Johnnise Renaud(7) def. Sherry Li(3) 7-5, 6-4. Boys 16s: Tommy Mylnikov(1) def. Alexandru Gozun(2) 7-5, 6-2. Girls 16s: Mia Horvit(3) def. Jessica Golovin(8) 6-1, 6-4. Girls 12s: Amanda Anisimova(8) def. Alyvia Jones(1) 6-2, 7-5. For complete results, including doubles, see the TennisLink site. 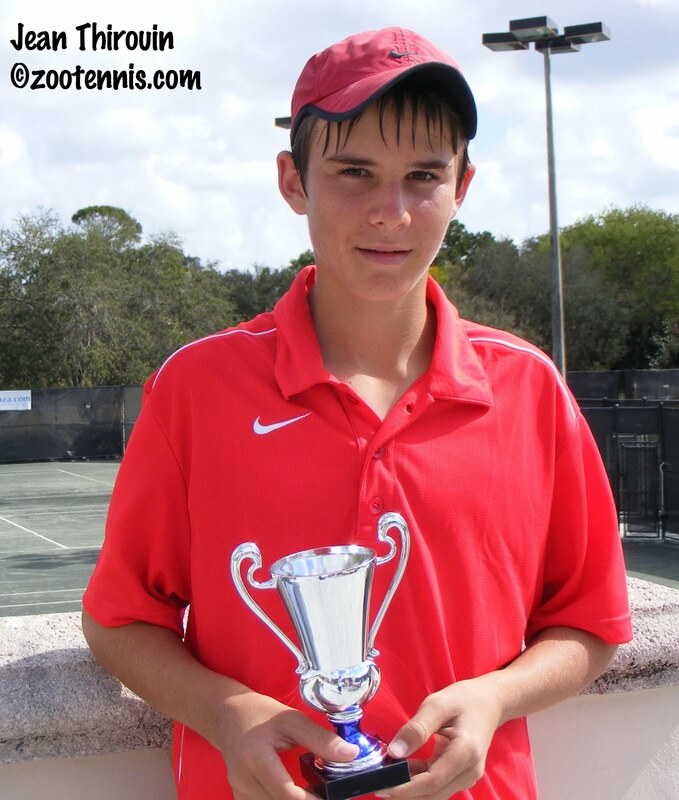 Last year, Ognjen Samardzic reached the Tennis Plaza Cup boys 18s final as an unseeded 16-year-old. This year, Samardzic has again reached the final, as the No. 2 seed, and taking over his role as unseeded underdog is 14-year-old Henrik Wiersholm. Neither boy had an easy time in his semifinal match, which in these USTA National Level 3 Regionals, is played on the same day as the quarterfinal. Samardzic defeated No. 4 seed Jake Albo, a longtime Florida rival, 6-4, 3-6, 7-6(5), with an unusual delay with Samardzic at 6-5, match point, in the tiebreaker. Serving a 3-4, Samardzic took a tumble near the service line, with Albo passing him to take a 5-3 lead. At 5-4, Albo had the match on his racquet, but missed a defensive volley just wide, so close that Samardzic asked the roving umpire to confirm the call. She did, but she also noticed that Samardzic had scraped his knees in the fall, and she left to ask the chief umpire if it was bad enough to warrant a stoppage in play. In the meantime, Albo lost his third straight point, when the drop shot he had used so effectively on numerous occasions late in the match floated harmlessly into Samardzic's strike zone and he put it away, giving him match point. The referee determined that Samardzic needed to leave the court to clean up his knees, and he returned several minutes later to play what turned out to be the final point. Albo got a good look at a forehand pass, but hit it wide, and Samardzic had overcome the disruption to reach the final for the second straight year. "It actually happened to me once before," said Samardzic, who said he had played Albo nine or ten times and had only lost once. "It wasn't match point, but it was 5-4 in the third and I was bleeding and I asked if I could continue play. That umpire said she would pretend she didn't see it, so I got away with it that time, so I was hoping for the same, but didn't get it this time." Wiersholm, playing in his second 18s tournament, lost the first set to Sam Swank, who had beaten top seed Grant Solomon in the second round Saturday, but quickly took a 5-0 lead in the second set. Things got really interesting then, with Wiersholm losing five straight games before taking the set in a tiebreaker and going on to take 2-6, 7-6(5), 6-4 decision. "I had three set points at 5-0," Wiersholm said of the second set. "And I ended up having seven set points before I won the set. Mentally I don't know where I am. I was a little bit surprised that it was that close and a little bit surprised that I won." Wiersholm and Samardzic have never played, but Nikola Samardzic, Ognjen's younger brother, does have a victory over Wiersholm. "At clays three years ago, my younger brother beat him, so it's a bit of extra pressure," Samardzic said. "It's an awkward situation. I know him only through (Stefan) Kozlov, they're pretty much the same generation. He's improved a lot, but that's all I know." The girls 14s final will feature No. 1 seed Sofia Kenin against unseeded Jaeda Daniel. The 13-year-old Kenin, who has yet to drop a set in her four victories, took a 7-5, 6-3 decision from No. 5 seed Adriana Reami 7-5, 6-3 in the semifinals, while Daniel eked out a 7-6(5), 6-7(1), 6-4 win over unseeded Madeline Meredith. The 12-year-old Daniel said she was fortunate to come through with the win. "She's a really good player and it's always hard to beat good players," said Daniel. "It was interesting, there were a lot of long rallies, but there wasn't a lot that I could do to hurt her. So it was just bad luck she lost." Daniel, who won the Florida Closed in the 12s, and was a semifinalist at the Eddie Herr 12s last month, is just beginning to make the transition to the 14s age division. "It's a tough transition," said Daniel, who is from Wesley Chapel, Florida. "The players are a lot better, tougher so it's going to be hard. It's fun, it's different, and I'm looking forward to it." The boys 14s final, which will be played Monday morning at Salvadore Park, along with the girls 14s and boys 18s, is a matchup of the top two seeds. Top seed Jean Thirouin overcame No. 3 seed Kaden Funk 4-6, 6-4, 6-3 in the semifinals, while No. 2 seed Michael Kuznerko defeated unseeded Pietro Rimondini 6-3, 6-2. Numbers 1 and 2 will also meet in the boys 16s finals at Biltmore Tennis Center, with top seed Tommy Mylnikov playing No. 2 seed Alexandru Gozun. In the girls 16s final, No. 3 seed Mia Horvit, who beat top seed Marie Norris in the semifinals, takes on No. 8 seed Jessica Golovin, who ousted unseeded Jeannez Daniel, Jaeda's older sister, in the semifinals. In the girls 18s, which are being played at the Riviera Country Club, No. 3 seed Sherry Li will face No. 7 seed Johnisse Renaud for the championship. Li defeated unseeded Katerina Stewart 6-3, 6-4, while Renaud took out No. 2 seed Alanna Wolff 7-6(4), 7-5. Stewart had toiled for just over four hours to defeat top seed Frances Altick 7-6(7), 4-6, 7-5 in the quarterfinals, saving a match point when Altick served for the match at 5-4 in the third, while Li needed barely an hour to get past Emily Groeneveld 6-0, 6-0. In the boys 12s, top seed Boris Kozlov will play No. 2 seed Antonio Mora for the championship. In the girls 12s, top seed Alyvia Jones will play No. 8 seed Amanda Anisimova. Draws and results are available at the TennisLink site. Grant Solomon, the top seed in the boys 18s at the Tennis Plaza Cup, a USTA National Level 3 Regional tournament, won his opening round match this morning against Lucas Dages 6-0, 6-0. But as a beautiful day in South Florida transformed into a lovely night, Solomon found himself in a much tougher battle with fellow 16-year-old Sam Swank, and when the match finally ended, after nearly three hours of play on the Har-Tru courts of Salvadore Park, Swank had the upset 5-7, 6-1, 6-3. Swank, from Bedford, New York, served too well for Solomon in the first set, with the top seed having difficulty getting returns in play. Swank held on to his break until serving for the set at 5-4, but was broken at love. "I choked. I was playing well, serving well and then at 5-4 I choked, didn't make any first serves," Swank said. "But I'm a always a fighter, so I always try to dig in." Swank had four chances to serve for the set again when Solomon went down 0-40 and then add out in the next game, but some excellent serving on the Texan's part, including two service winners and an ace got him out of that mess. With his forehand continuing to give him trouble, Swank was broken at love again in the next game, but any frustration he felt at the missed opportunities didn't erupt to the surface. In the second set, he took a 4-0 lead, which he attributed to Solomon relaxing a little too much. "He eased up, and that happens a lot after winning the first set," Swank said. "I got a big lead in the third, and that was it." Although Swank did lead 4-1 in the third set, it was only one break, and Solomon got it back to 4-3, only to be broken in the next game. At 30-40, a long and often brilliant point ended with Swank finally putting away his second overhead, and he would serve for the match. Asked if the disaster of the first set went through his mind, Swank was philosophical. "One thing I've learned about tennis is that you can't dwell in the past," Swank said. "I messed up that first set, but I cleared it out of my mind, and I have enough belief in myself that I can do it for sure." Swank fell behind 15-40 in that final game, but hit an ace to save one break point, and a soft touch volley off an awkward net cord to save the second. At deuce, Solomon netted a backhand pass to give Swank his first match point, and he converted it with a forehand volley winner. Swank said he believes he has underachieved on the national stage. "I was playing really well in my section, but when I would get to the national level, I would struggle. It's something I'm focusing on, to play more of these tournaments, get more experience." Stefan Kozlov was in the draw as the No. 3 seed but was still competing in the Grade 1 in Colombia and so was replaced by an alternate. No. 2 seed Ognjen Samardzic and No. 4 seed Jake Albo won both their matches today. In addition to the boys 18s, the boys and girls 14s are also being played at Salvadore Park. Top seeds Sofia Kenin and Jean Thirouin had byes in the opening round, and advanced to the third round with routine wins this afternoon. The girls 18s are being played at the Riviera Country Club, and the top seed there, Frances Altick, is through to the third round, where she will play Junior Orange Bowl 14s champion Katerina Stewart. The unseeded Stewart beat No. 8 seed Natalia Janowicz 6-2, 6-3 in today's second round. In the 16s, at Biltmore Tennis Center, top seeds Tommy Mylnikov and Marie Norris are through to the quarterfinals, as are 12s top seeds Boris Kozlov and Alyvia M. Jones at Tropical Park. Full draws at the TennisLink site. Francis Tiafoe gave himself quite a 14th birthday present today, beating Michael Mmoh 6-3, 6-3 in the all-American Aegon Junior International Teen Tennis 14-and-under tournament in Bolton, England. Tiafoe, the No. 15 seed, had reached the semifinals in the tournament last year. He won every match in straight sets, and beat the No. 7, No. 1 and No. 3 seeds in his final three wins. The news was not as good for the US in the girls final, with Great Britain's Maia Lumsden, the No. 5 seed beating No. 8 seed Tornado Ali Black 7-5, 6-1 to claim the girls championship. The US claimed three of the four titles in Bolton, the boys and girls doubles and the boys singles, and the eight players now cross the Channel for the Les Petits As, in Tarbes, France. All eight are in the main draw there, but the qualifying for the prestigious event has begun. For the qualifying draws and other information, see the tournament's website. For the complete results at Teen Tennis, see the Tennis Europe website. For more on the finals at Bolton, see usta.com. In Australia, qualifier Krista Hardebeck of the US won the ITF Grade 1 Loy Yang in Traralgon, beating No. 6 seed Anna Schmiedlova of Slovakia 7-5, 6-4 in the final. Hardebeck received a walkover from An-Sophie Mestach of Belgium, the 2011 Australian Open girls champion, who will not defend her title due to a recurring wrist injury, in the quarterfinals, so she had to win "only" seven matches to take her first junior title since the Easter Bowl Grade B1 in 2010. Hardebeck beat four seeds, not including Mestach, in her run to the final, and received a special exemption into the Australian Open junior championships. No. 16 seed Filip Peliwo of Canada surprised top seed and world No. 1 Luke Saville of Australia in the boys final, saving two match points to take the championship 3-6, 7-6(5), 6-4. Nick Kyrgios of Australia and Wayne Montgomery of South Africa won the boys doubles; Ilka Csoregi of Romania and Elizaveta Kulichkova of Russia won the girls doubles. 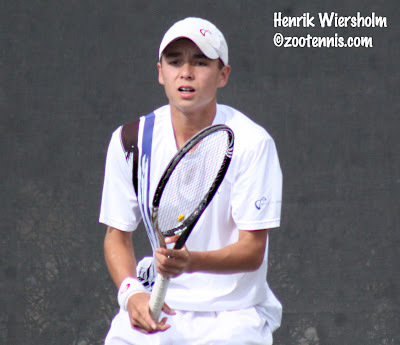 Four Americans qualified for the Australian Open junior championships Friday, with Julia Elbaba, Catherine Harrison, Trey Strobel and Mackenzie McDonald earning spots in the main draw, which begins Sunday (Saturday night in the US). The draws should be out early Saturday morning here in the US, and can be found at the ITF junior website. I spent a few hours today back at the Frank Veltri Tennis Center, where the Orange Bowl was held last month, watching the quarterfinals of the $25,000 women's pro circuit event there. I was particularly interested in the match between Elizaveta Ianchuk of Ukraine, who had played the Orange Bowl, and American Lauren Davis, who I had last seen winning the 2010 Orange Bowl at Crandon Park. Davis, who still occasionally suffers symptoms related to the concussion she got last spring when a piece of TV equipment fell on her head as she prepared for an interview, looked in great form, quickly taking control of the match from Ianchuk. Ianchuk, like Davis 18 years old, barely had a game point on her serve in the entire match, and the only game she won was a break of Davis in the fifth game of the first set of the 6-1, 6-0 clinic. Davis served well, hit both her forehand and backhand with great depth and pace, and also found some impressive angles. She will face an entirely different opponent in the semifinals against veteran Ahsha Rolle of the US, who uses her touch and volley skills relentlessly, even on the Har-Tru surface. Davis also reached the semifinals of the $25,000 tournament in Innisbrook last week, before falling in three sets to Grace Min. The other semifinal in Plantation will feature the only seeded player to make the quarterfinals, No. 5 Gail Brodsky, who beat Heidi El Tabakh of Canada 7-5, 6-3. She faces Johanna Konta of Australia, a 6-1, 6-3 winner over Alexandra Stevenson of the US. At the $10,000 Futures just north of Plantation, Jack Sock beat Andrea Collarini 6-3, 6-1 to advance to the semifinals, where he'll play No. 7 seed Nicholas Devilder of France. Sock has yet to drop a set in his eight wins to start off 2012. No. 6 seed Pedro Sousa of Portugal will play unseeded Olivier Patience of France, who breezed past American Brian Baker 6-1, 6-1 today. Former University of Illinois player Ruben Gonzales and Chris Kwon won the doubles title, beating Sekou Bangoura and Ed Corrie 6-3, 7-5. For all results, see the Pro Circuit page at usta.com. 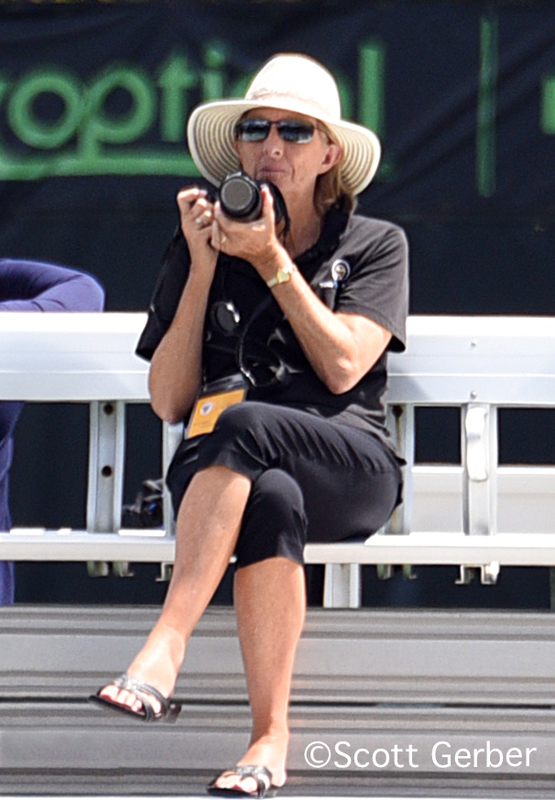 I will begin coverage of the National Level 3 Regional this weekend in Coral Gables, the Tennis Plaza Cup, tomorrow. Grant Solomon and Frances Altick are the top seeds in the 18s; Tommy Mylnikov and Marie Norris are the top seeds in the 16s. For the seeds in all four divisions, and the draws, see the TennisLink site. There wasn't much drama in either of the second round wins posted by Brian Baker and Jack Sock Thursday at the Pro Tennis World $10,000 Futures at the Sunrise Tennis Club; that would be provided by others. The 26-year-old Baker, coming back from five different surgeries in the past four years, beat qualifier Ed Corrie 6-2, 6-2, and Sock, who won the first US Futures of the year last week, defeated No. 5 seed Matwe Middelkoop 6-1, 6-1. Sock needed less than an hour to down the 28-year-old from the Netherlands, whom he had beaten last week on his way to the Plantation title. "It's always nice playing a guy the week before," said Sock, who is traveling with his new fitness trainer Farhad Zarif. "Knowing his tendencies, weaknesses and all that. I was just trying to make the points long and play every point hard, and I think I did that again, and wore him down a little bit." Middelkoop has a good serve and a powerful forehand, but his shot tolerance was low, with Sock's chances of winning a point increasing with every stroke he could make. Middelkoop also seemed incredulous most of the match, but whether that response was to his own poor play or some of Sock's more stunning winners was hard to say. Sock employed the drop shot effectively in the first three games on the Har-Tru courts, mostly for outright winners, and he also won the majority of the net exchanges with his touch and reaction. He also hit a jumping forehand winner, which is commonly seen on the two-handed backhand side, but rarely used on the forehand; the dozen or so people watching broke into applause, not for the first time. After losing nine straight games from 1-0 in the first set, Middelkoop got on the board, but never threatened to change the tenor of the match, and Sock easily closed out his seventh straight win to start the year. "My fall obviously wasn't great," said Sock, who has accepted wild cards into the ATP events in San Jose and Memphis. "I didn't play many matches at all compared to a lot of the players out there. So I just wanted to come here to hopefully play a lot of matches, get some wins, get the confidence where it needs to be. I need to work on my game, play a lot of tennis." In addition to the ATP events, Sock may play next week's Challenger in Hawaii and is also hoping to play at the Dallas Challenger next month; he would need wild cards for both events. Baker also has Dallas and Memphis in his sights. "You have to start here," said Baker, of Nashville, Tenn. "That's what everyone has to do. Even though I've done this when I was 16, 17, 18, now I have to do it again. Hopefully I can play well enough to get out of [the Futures] sooner rather than later. I'll have to play the qualies in Dallas, and then I'll play the qualies of Memphis." The first five games between Baker and Corrie, the former University of Texas standout from Great Britain, went to the server, but Corrie had difficulty holding after that, broken the next three times he served and then in the match's final game. There were many long rallies, but once he got comfortable with his footing, Baker was able to come forward and play more offensive tennis. Corrie was especially vulnerable on his second serve, with Baker's return resulting in many outright winners. Baker who is 21-5 (including qualifying wins) since returning to the tour last July, will play Olivier Patience of France, also unseeded, in the quarterfinals. Patience beat qualifier Sekou Bangoura 6-3, 2-6, 6-4, in a match that found both players struggling to hold serve. At 2-3 in the third set, Bangoura was broken, which started a string of five consecutive breaks of serve. Patience served for the match at 5-3, but didn't get to match point. Bangoura couldn't get to game point in the final game however, and with a well-executed backhand volley on his second match point, Patience moved past the former Florida Gator. Sock will meet unseeded Andrea Collarini of the US, who defeated qualifier Rhyne Williams 6-2, 6-7(5), 6-4 in a match that took three hours and fifteen minutes to complete. Collarini, the left-hander who spent his formative years in Argentina, was up a set and serving at 5-2, when Williams began his comeback. Collarini was broken at 15 at 5-2 and at love at 5-4, with his first serve the primary culprit, although Williams did play error-free tennis during this stretch. Collarini, 19, didn't make a single first serve in that tenth game, double faulting once, and all the momentum was with Williams, who promptly lost his serve at 15 in the next game. With Collarini serving for the match for the third time, he did get to match point, but he wasn't able to convert it, with Williams passing him with a crosscourt forehand to save it. Two Collarini errors later it was 6-6, and Williams, the 2011 NCAA finalist while at Tennessee, ramped up his serving in the tiebreaker, hitting two aces and controlling the points on his serve with other effective first serves. The weather was sunny, with a slight breeze, but there was no humidity, and both players looked fresh as the match approached the two-and-a-half hour mark. Although loudly bemoaning his fate at times, Williams kept his cool when he was in deep trouble, even when the chair umpire overruled himself not once but twice on Williams service winners with Williams serving at 1-2. Rather than getting the points, Williams had to win them again, but even though he did lose one of the replayed points, Williams did hold on to take the game and didn't let the bad luck send him off the rails. Collarini got the first break of the final set, with Williams double faulting at 30-40 at 2-3. Collarini served for the match at 5-3, but again did not get to match point, and was broken for 5-4. Williams led 40-0 in the next game, but then his backhand began to cost him points, with a slice netted and a two-hander wide to make it 40-30. Collarini made a great return on the next point and never relinquished control of it, putting away an overhead after a long rally to make it deuce. Williams had two more game points he couldn't convert, and when he netted a forehand, Collarini had his second match point, more than an hour after his first. Williams' backhand pass handcuffed Collarini and he netted the volley, but he earned match point number three with a perfect forehand volley and ended the struggle with a crosscourt backhand winner. Collarini and Sock played in January last year in the Tamarac Futures final round of qualifying, with Collarini winning 7-6(3), 6-3. The other two quarterfinals will feature No. 4 seed Boy Westerhof of the Netherlands against No. 6 seed Pedro Sousa of Portugal and unseeded Morgan Phillips of Great Britain against No. 7 seed Nicolas Devilder of France. The doubles final is set with No. 4 seeds Bangoura and Corrie against No. 3 seeds Chris Kwon and Ruben Gonzales. Complete draws can be found at the Pro Circuit results page at usta.com. I spent the day at the Pro Tennis World Futures in Sunrise today, and I'll have more on the second round matches in a separate post later tonight, but I wanted to pass along a link to the Australian Open Junior Championship preview I wrote for the Tennis Recruiting Network. Last night, after I submitted the story, qualifier Krista Hardebeck beat Russia's Yulia Putintseva, the No. 3 seed, 6-3, 6-2 to advance to the final of the Grade 1 in Traralgon. She will play No. 6 seed Anna Schmiedlova of Slovakia in the final Friday (Thursday night here in the US). Top seed Luke Saville of Australia will play No. 16 seed Filip Peliwo of Canada in the boys final. For draws, see the ITF Junior website. I also wanted to update everyone on the results of today's action at the Teen Tennis 14-and-under tournament in Bolton, England. For the second consecutive year, two American boys will meet in the final, with Michael Mmoh, the No. 3 seed, playing No. 15 seed Francis Tiafoe for the title. Last year, Stefan Kozlov beat Henrik Wiersholm in the final. Mmoh beat Nathan Ponwith of the US 6-0, 6-3, while Tiafoe, a semifinalist last year, eliminated top seed Kenneth Raisma of Estonia 7-6(3), 7-5. The unseeded American team of William Blumberg and Ponwith won the doubles title over the two singles finalists however, beating Mmoh and Tiafoe 3-6, 7-5, 10-7. Although seeded No. 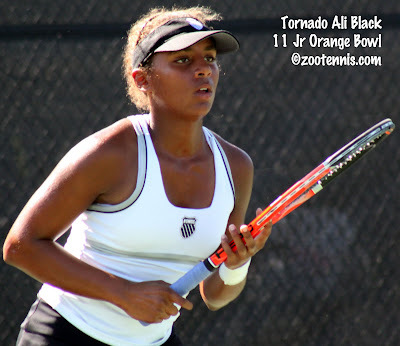 8, Tornado Ali Black of the US had no trouble with top seed Olga Fridman of Ukraine, taking a 6-2, 6-1 decision to reach the final. She will no doubt be tested by the British crowd, who will be supporting their own Maia Lumsden, the No. 5 seed, who beat No. 11 seed Emma Higuchi of the US 2-6, 7-6(5), 6-3 in the semifinals. Black has already secured one Teen Tennis title, as she and fellow American Nicole Frenkel, the No. 4 seeds, beat No. 3 seeds Lumsden and Jazzy Plews of Great Britain 6-2, 5-7, 10-6. For complete draws, see the Tennis Europe website. The USTA teams at the Aegon Junior International Teen Tennis in Bolton continued to find success, with three boys and two girls reaching the semifinals. Michael Mmoh, the third seed in the boys event, was the only player seeded to reach the semifinals. 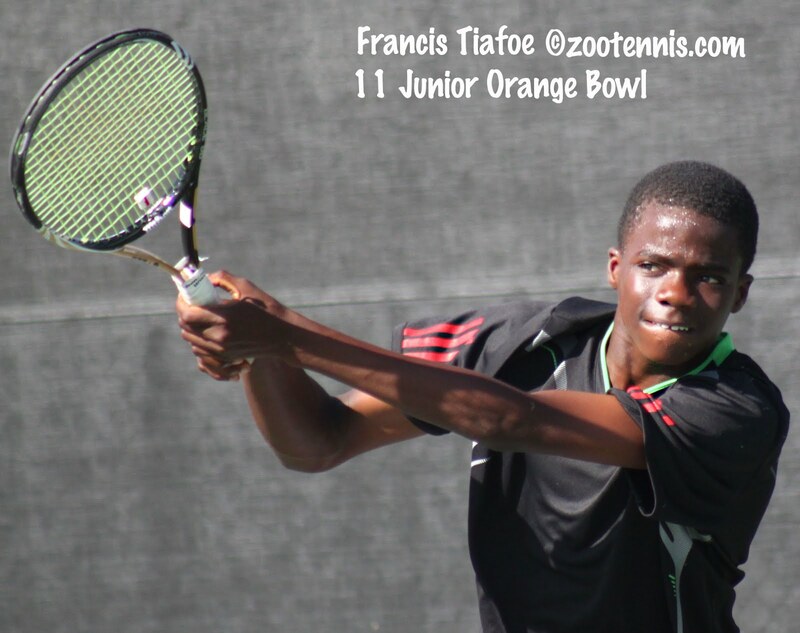 Francis Tiafoe, the 15th seed, advanced today with a 7-6(6) 7-6(3) win over No. 7 seed Daniel Bennett of Great Britain, and unseeded Nathan Ponwith took out No. 2 seed Samuel Sippel of Germany 2-6, 6-4, 6-3. William Blumberg, the fourth American boy on the trip, lost to top seed Kenneth Raisma of Estonia 6-4, 6-3. Tiafoe and Raisma will play in one semifinal, with Ponwith and Mmoh the other. The boys doubles champions will be Americans, with No. 4 seeds Mmoh and Tiafoe taking on unseeded Blumberg and Ponwith in the final. Tornado Ali Black, the No. 8 seed, and Emma Higuchi, the No. 11 seed, won through to the semifinals today. Black defeated No. 4 seed Aleksandra Pospelova of Russia 6-3, 6-0 and Higuchi downed No. 2 seed Simone Alipieva of Denmark 6-4, 6-3. Black and Nicole Frenkel will play for the doubles title, taking on Great Britain's Mai Lumsden and Jazzi Plews. For complete results, see the Tennis Europe website. On the other side of the globe, qualifier Krista Hardebeck beat fellow American Taylor Townsend 6-4, 6-2 to reach the semifinals of the Grade 1 in Traralgon, thereby earning a special exemption into the Australian Open junior championships. At least that's my guess, since she doesn't appear in the Australian Open qualifying draw that was released on Wednesday. US girls in qualifying are Catherine Harrison, Elysse Graci and Julia Elbaba. The US boys in qualifying are Trey Strobel, Harrison Richmond and Mackenzie McDonald. The qualifying draws are posted at the ITF junior website. We're heading to Florida tomorrow for a couple of days at the Futures in Sunrise and Plantation and then down to Coral Gables for the National Level 3 Tennis Plaza Cup, which is Saturday, Sunday and Monday. I don't get to many Futures during the year, but these early ones in Florida have been on the itinerary for many years, and it is always an opportunity to reconnect with some of the junior and college players I've gotten to know over the years. Qualifiers for the $10,000 men's Futures in Sunrise are: Daniel Yoo, Rhyne Williams, Laslo Urrutia Fuentes, Antoine Benneteau, Sekou Bangoura, Guillermo Gomez-Diaz, Ed Corrie and Yoshihito Nishioka. The qualifiers for the $25,000 women's event in Plantation are: Danielle Collins, Allie Kiick, Gabriela Paz, Courtney Colton, Iveta Gerlova, Jovana Jaksic, Elizaveta Ianchuk and Federica Grazioso. For complete draws, see the Pro Circuit page at usta.com. At the Teen Tennis tournament in Bolton, England, all four US boys who made the trip reached the quarterfinals: Michael Mmoh(3), Francis Tiafoe(15), Nathan Ponwith and William Blumberg. They are all in separate quarters, with Blumberg playing the top seed and Ponwith the second seed tomorrow. They have also all reached the doubles semifinals, with Ponwith and Blumberg one team and Mmoh and Tiafoe the other. The two seeded US girls, Tornado Ali Black(8) and Emma Higuchi(11), reached the quarterfinals. Nicole Frenkel lost today to the top seed, while Raquel Pedraza lost in the second round. Black and Frenkel are in the semifinals of the doubles competition. Complete draws can be found at the Tennis Europe website. In Australia, the quarterfinals of the ITF Grade 1 Loy Yang at Traralgon are this evening (Wednesday in Australia). 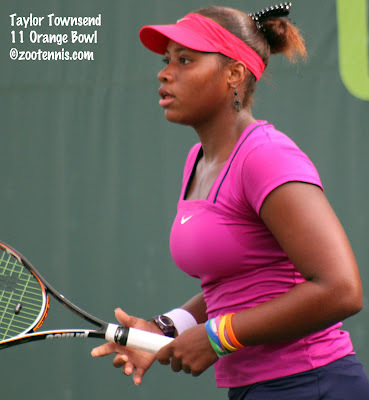 Taylor Townsend will face Krista Hardebeck for a spot in the semifinals after both advanced yesterday. Hardebeck, who qualified, received a walkover from the much-injured Belgian An-Sophie Mestach, while No. 13 seed Townsend beat Orange Bowl champion and No. 2 seed Anett Kontaveit of Estonia 6-1, 7-6(3). Townsend is the subject of this ESPN High School feature by Sandra Harwitt, who is currently in Australia, and I'm sure will keep an eye on Townsend's progress in the junior championships. Kyle McPhillips, the No. 15 seed, advanced to the quarterfinals when top seed Eugenie Bouchard retired trailing 6-2, 3-3. Bouchard later posted a tweet mentioning food poisoning. McPhillips will play unseeded So-Ra Lee of Korea in the quarterfinals. The only US boy in the main draw, qualifier Mackenzie McDonald, lost in the second round to Borna Coric of Croatia, although he is still alive in doubles with Portugal's Frederico Silva. At the Australian Open, Sloane Stephens and Christina McHale have reached the second round for the second consecutive slam (third straight actually for McHale) and they are joined by qualifier Jamie Hampton, Vania King and, of course, Serena Williams. For more on the next generation of US women, see this Associated Press article, which quotes Stephens on the budding rivalries. I usually need to go to several sites to track the individual tournaments that dot the college landscape this time of year, but tonight usctrojans.com was the place for one-stop shopping. The three-time defending NCAA champion men dominated the Sherwood Cup, which featured players from Baylor, Stanford and UCLA, with five of the eight quarterfinalists and all four semifinalists wearing the cardinal and gold. Steve Johnson extended his collegiate win streak to 40 with five wins over the weekend, the toughest of which came against UCLA's Nick Meister in the quarterfinals. After beating Emilo Gomez in the semifinals, Johnson defeated Daniel Nguyen 6-2, 6-2 in the final, but Nguyen triumphed in the doubles final. He and Raymond Sarmiento, who had lost to Nguyen in the semifinals, beat Johnson and freshman Yannick Hanfmann 9-7. Those looking for reasons to favor a team other than USC for the NCAA title in May didn't find anything to support their case this weekend. The USC women have been absent from the NCAA Sweet 16 the past three years, but have hopes of ending that streak with a fine freshman class, which has already made waves nationally. 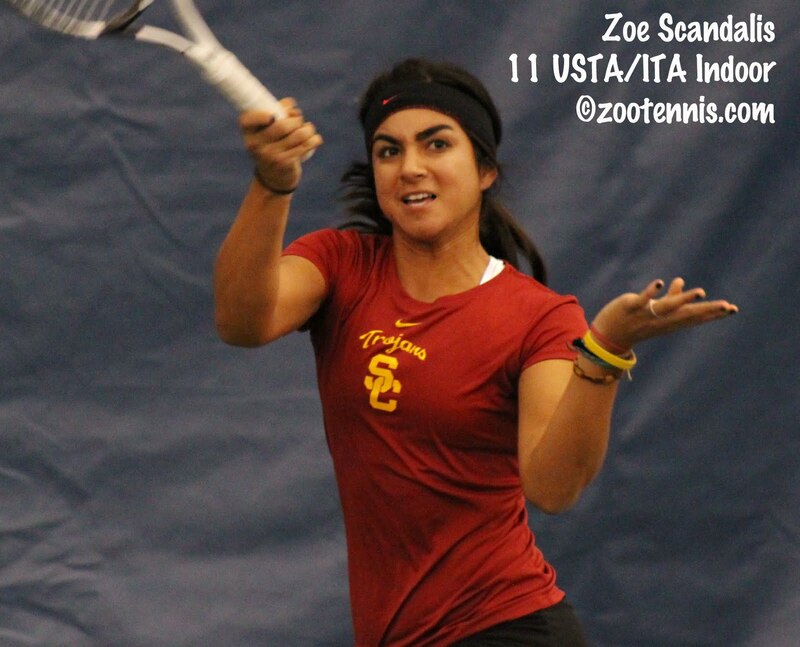 Newcomer Sabrina Santamaria won the USTA/ITA Indoor Intercollegiate doubles championship with Kaitlyn Christian last fall and freshman Zoe Scandalis won the Freeman Invitational this week, beating eighth-ranked Robin Anderson of UCLA, the tournament's No. 2 seed in the semifinals, and top-ranked Mallory Burdette of Stanford, the No. 1 seed in the tournament in the final. According to the twitter reports, No. 5 seed Scandalis was down a set and two breaks before beating Burdette 6-7(8), 7-6(5), 6-3. USC's Danielle Lao won the La Quinta tournament, defeating top seed Emily Fraser of Virginia 7-6(5), 6-0. For more, see the USC website. 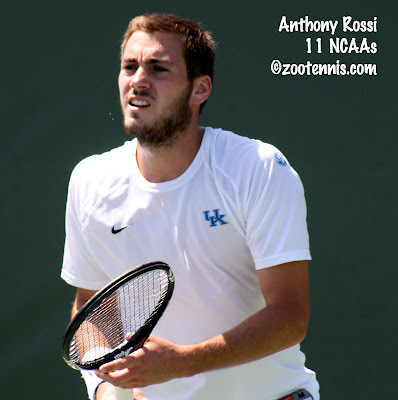 At the Coaches SEC Indoor tournament, Kentucky's Anthony Rossi took the title on his home court, beating Georgia's Sadio Doumbia 6-4, 6-3 in the final. The Thiemann twins, Marcel and Chris, won the doubles title with a 8-3 decision over Georgia's Wil Spencer and Garrett Brasseaux, and they were hardly the only Ole Miss success story. Freshman William Kallberg beat Wil Spencer of Georgia to reach the quarterfinals, With freshman Nik Scholtz and junior Jonas Lutjen reaching the semifinals. For complete results, see the tournament page at the Kentucky website. The wild cards for the Australian Open junior championships have been announced, with no big junior names requesting wild cards. I believe all the recipients of main draw wild cards are Australian. Sara Tomic, Bernard's 13-year-old sister, received one, as did Naiktha Bains, who just turned 14 last month. The complete list is here (pdf). 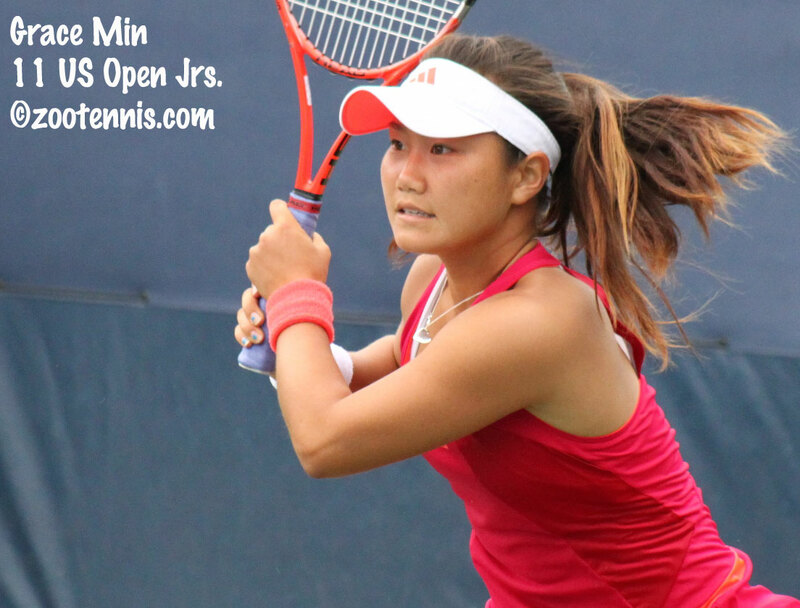 It was a very successful day for US Open junior champions and Kalamazoo champions, with Grace Min, Jack Sock and Austin Krajicek claiming titles on the ITF men's and women's circuits. Sock, who won the Kalamazoo 18s title in 2010 and 2011 and the US Open boys championship in 2010, won his first Futures singles title since November of 2009, beating 18-year-old Jason Kubler of Australia 6-1, 7-6(5) in the $10,000 Futures in Plantation, Florida. The 19-year-old Sock, seeded eighth, didn't drop a set all week on the Har-Tru, the same surface as his previous Futures title in 2009, in Amelia Island. Recent Texas A&M graduate Austin Krajicek, who won Kalamazoo in 2008, captured his first singles title as a pro in the $15,000 China Futures, beating top seed Ze Zhang of China 3-6, 6-3, 7-6(4). The 21-year-old, who won the NCAA doubles championship with Jeff Dadamo last year, reached the final in last week's Futures in China, and this week, he and 2009 NCAA champion Devin Britton advanced to the final of the doubles tournament. Sock also reached the doubles final in Plantation with Nick Monroe, losing to University of Virginia's Jarmere Jenkins and Drew Courtney. The third American to take a title today is Grace Min, the 2011 US Open girls champion, who won her first professional title (she is still an amateur) today in the $25,000 event in Innisbrook Florida. Min, 17, qualified for the tournament, and beat No. 2 seed Gail Brodsky 2-6, 6-2, 6-4 in final for her eighth consecutive win. It was a great rebound for Min, who had lost 6-0, 6-0 to Alison Riske in the first round of the USTA's Australian Open wild card tournament in her hometown of Atlanta last month. Brodsky had beaten Riske in that same tournament to advance to the final, where she lost to Madison Keys. For complete draws from the Florida Pro Circuit events, see usta.com. An the ITF Grade 1 in Venezuela, No. 7 seed Filip Bergevi of Sweden defeated No. 12 seed Christian Garin of Chile 6-4, 6-2 to claim his first Grade 1 title. Noah Rubin and Stefan Kozlov of the US were originally scheduled to play in the tournament, but did not make the trip. The girls singles title at the Copa Gatorade went to No. 7 seed Daria Salnikova of Russia, who defeated No. 11 seed Petra Uberalova of Slovakia 3-6, 6-1, 6-4. Christina Makarova of the US, the No. 3 seed, lost to doubles partner Uberalova in the quarterfinals, but the pair reached the doubles final before falling to Domenica Gonzalez of Ecuador and Laura Pigossi of Brazil 3-6, 6-3, 10-7. The boys doubles title went to Bergevi and Jeroen Vanneste of Belgium, who beat the Russian pair of Fedor Andrienko and Anton Desyatnik 6-2, 6-4. The draws for Aegon Junior International Teen Tennis Bolton, which I'll shorten to Teen Tennis, came out today, and each of the boys and the girls 14-and-under draws have four US players, two of them seeded. Tornado Ali Black, known as Alicia Black in the draw, is seeded No. 8 and wild card Emma Higuchi is seeded No. 11 in the girls 48 player field, while Michael Mmoh is seeded No. 3 and Francis Tiafoe No. 15 in the boys. Nicole Frenkel, Raquel Pedraza, Nathan Ponwith and William Blumberg are the unseeded Americans, and they will begin play on Sunday, while the seeds have first round byes. The top-seeded girl is Olga Fridman of Ukraine and the No. 1 boys seed is Kenneth Raisma of Estonia. I am a little surprised at how low Black is seeded, but she won the Eddie Herr 16s as an unseeded wild card, so it's not as if it will seriously damage her chance of winning. The complete draws can be found at the Tennis Europe website. Five Americans reached the main draw of the Australian Open through qualifying on Saturday. Denis Kudla will make his main draw debut at a slam against Tommy Haas on Monday after beating Australian Carsten Ball 7-6(1), 7-5. Alex Kuznetsov beat Yuichi Sugita of Japan 3-6, 6-2, 6-3 and now faces No. 2 seed Rafael Nadal on Monday. In the unlikely event that they both win, Kudla and Kuznetsov will play each other in the second round. The women's qualifiers are Alison Riske, a 6-4, 6-2 winner over Alexandra Panova of Russia, Jamie Hampton, who beat Kirsten Flipkens of Belgium 7-5, 6-4, and Varvara Lepchenko, who defeated Aleksandra Krunic of Serbia 6-1, 6-2. Laura Robson of Great Britain also qualified, but Irina Khromacheva of Russia fell one match short. Lepchenko drew No. 20 seed Daniela Hantuchova of Slovakia, Riske will play Urszula Radwanska of Poland and Hampton meets Mandy Minella of Luxembourg. Complete draws can be found at the Australian Open website. And for more on the men's qualifying, see this blog post from Shank Tennis. The qualifying is complete at the ITF Grade 1 Loy Yang in Traralgon Australia, with three Americans making it through to the main draw: Krista Hardebeck, Catherine Harrison and Mackenzie McDonald. Other US players in the draw, which is always strong due to the tournament's timing right before the Australian Open juniors are: Kyle McPhillips(15), Samantha Crawford, Gabby Andrews, Sachia Vickery(16) and Taylor Townsend(13). Connor Farren is in Australia, but not playing this tournament, resting a sore wrist in hopes of being able to compete in Melbourne. In the $25,000 Women's Pro Circuit event in Innisbrook, Grace Min beat Lauren Davis 7-6(5), 4-6, 7-5 in today's semifinal to claim her seventh straight win. She will play No. 2 seed Gail Brodsky, who defeated Lauren Embree 7-6(3), 6-0. It is Min's second Pro Circuit final; she lost in the final of the $25,000 Rock Hill event last October. Brodsky won a $25,000 event in Spain in July for her first championship above the $10,000 level. Jack Sock reached the final of the $10,000 Plantation Futures, advancing when No. 5 seed Matwe Middelkoop of the Netherlands retired trailing 6-3, 4-1. The eighth-seeded Sock will play unseeded 18-year-old Jason Kubler of Australia, who won back-to-back Futures events on the same Har-Tru surface as Plantation last October and November. Kubler beat No. 6 seed Nicolas Devilder of France 6-2, 1-6, 7-6(4). For complete draws, including the qualifying draws of the two Florida Pro Circuit events next week, see the page at usta.com. The sports agency Octagon has announced the signing of Tornado Ali Black to a representation contract. The 13-year-old Black, who reached the finals of the 12s and 14s at the Eddie Herr in 2009 and 2010 and won the 16s division last year, is currently in Europe for Teen Tennis and Les Petits As. Black, who lives in Boca Raton, trains at the USTA National Center. Tom Perotta of the Wall Stree Journal published this article on the ITF/USTA initiative on 10-and-under tennis. I'm sure you've seen the many advertisements proclaiming "the rules of tennis have changed," which seems a bit melodramatic to me, but the smaller courts, nets, racquets, and most of all, the different balls, must now be used in all sanctioned federation 10-and-under tournaments. Perotta gives plenty of space to the objections to the format, although I must admit I had not heard the injury concern voiced until I read this story. Nick Bollettieri and Patrick McEnroe come out in favor, while others, including Tennis Australia, are not exactly all-in on the concept. I don't have any expertise from which to address this issue, as I don't follow or cover much of the 12-and-unders, let alone the 10-and-unders, but I do see some 10-year-olds who play in the 12s, which is perfectly acceptable to all federations, so I'm not sure how it holds the very top players back. I confess that I don't see the need for sanctioned 10-and-under tournaments, but again, I haven't studied the issue closely and don't understand most of the objections. Other sports have no trouble attracting players with altered rules and dimensions more suitable for the very young, so I don't see why tennis would consider itself above that concession. Will this somehow stunt the growth of the sport? I simply don't see how, so on balance, I think helping bring more success to younger players is worth the cost of the disruption we're going through now. In the $25,000 Women's Pro Circuit event in Innisbrook, four Americans have advanced to the semifinals. Qualifier Grace Min defeated Jessica Pegula 6-3, 6-3 today and will face unseeded Lauren Davis in Saturday's semifinal, which will be a rematch of the 2010 Orange Bowl final, won in three sets by Davis. In the other semifinal, qualifier Lauren Embree, a junior at the University of Florida, will play No. 2 seed Gail Brodsky. In the $10,000 men's Futures in Plantation, No. 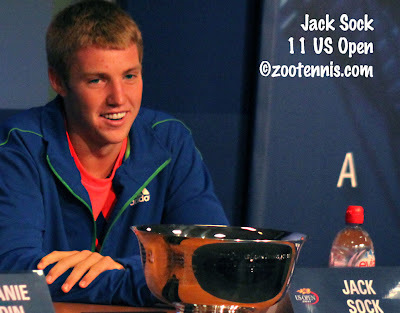 8 seed Jack Sock has reached the semifinals, beating No. 3 seed Benjamin Balleret of Monaco 6-3, 6-1 in today's quarterfinal. Sock and partner Nick Monroe, the No. 2 seeds, lost the doubles final today to the unseeded University of Virginia team of Drew Courtney and Jarmere Jenkins 7-6(3), 7-5. This is the time of year I look ahead, eager to find out how the college and junior tennis world may change in the months to come. And although 90 percent of my work for the Tennis Recruiting Network is tournament recaps and previews, recruiting profiles and coaching interviews, they have always welcomed this speculative and subjective piece. And if anyone has any other evidence to suggest that Beth Herr is not the last junior slam winner to go to college before turning pro, please let me know. There is no place to go for that kind of information, so I spent a lot of time putting names into google to come up with that particular tidbit. Beth Herr is still very much involved in tennis, as she is married to Steve Bellamy, the founder of the Tennis Channel, and is a dedicated tennis mom to their four boys. With all their success recently on the international junior tennis stage, the British are hopeful it will translate into success on the professional tour, so Andy Murray isn't their sole ATP Top 100 player (James Ward is their only other Top 200 player). This article from The Telegraph gives the rundown on eight boys, settling on US Open boys semifinalist Kyle Edmund as the most promising. I'm sure Greg Rusedski has much to add in helping prepare these boys for what's ahead, but I do wish their lifelong coaches were given more recognition for their development work. Laura Robson, who has gotten this sort of media scrutiny for years, beat Melanie Oudin 6-3, 6-4 in the first round of women's qualifying at the Australian Open Thursday, but as this New York Times Straight Sets blogpost reveals, it was far from the routine win the score would suggest.